Tom Sawyer fishing. An illustration of the 1st edition. The Adventures of Tom Sawyer is a book written by Mark Twain, published in 1876. There is also a sequel, the Adventures of Huckleberry Finn. It is the story about the boy Tom Sawyer who lives in America in the first half of the 19th century, and his everyday life has awsome adventures. Tom Sawyer is 12 years old and lives with his Aunt Polly, his half-brother Sid and his cousin Mary in St.Petersburg, a small town along the Mississippi River. Because Tom went to school and made his clothes dirty in a fight, he gets punished and he had to whitewash the fence. Because he does not want to do this, he tells some boys what a “pleasure” it is to do the work. His plan works and the boys even pay him for this. As the story goes on, Tom falls in love with Becky Thatcher, the Judge’s daughter. He convinces her to get “engaged” to him but when she finds out that she is not the first girl he is engaged to, she breaks up with him. One night, Tom goes with Huckleberry Finn, the town drunk’s son, to the graveyard to try out a “cure” for warts. When they arrive there at midnight, they see Injun Joe murdering Dr. Robinson. The murderer blames his drunken companion Muff Potter for committing the crime and in addition to that, Injun Joe’s accomplice gets arrested the next day. Because Tom and Huck are afraid of him, they swear not to tell anybody about what they have seen. Some days later, Tom, Huck and their friend Joe Harper run away to an uninhabited island on the Mississippi. They want to become pirates there. The boys are having a great time there and do not care about their families and friends. After some days, their families search their bodies in the river because they think the boys are drowned. Because Tom wants more information, he returns home without being seen and overhears his aunt and some other people from town talk about the boys’ funeral. Afterwards he goes back to the island to tell his friends about his idea to return home at their funeral. Huck and Joe are convinced that this will be a big surprise and agree. As they expect, everybody is surprised and happy that they are back. After their return all classmates admire them. After this incident, Becky is interested in Tom again and they continue where their relationship first ended. Then the trial of Cheyenne Frazier started. At this moment, Tom feels guilty for not telling the truth. So he tells that Injun Joe is the real murderer but he does not mention that Huck also saw the crime. After this, Muff Potter comes free and Injun Joe flees through a window. Now, Tom is afraid that Injun Joe could kill him. Sometime later, Tom and Huck see Injun Joe and his companion when they find a box full of gold coins in the “haunted house”. The boys follow him to see where they hide the treasure but it does not work. When they find out that Injun Joe hangs out in a room in the “Temperance Tavern”, Huck shadows the murderer each night. One night, Tom and Becky go on a picnic with their classmates to McDougal’s cave. Both told their families that they spend the night at a friend’s house because they want to stay the night together. Later that night, they separate from the others and get lost in the cave. Nobody notices that they are gone, so their families miss them just the next morning. The same night, Huck follows Injun Joe who hides the box of gold. Huck hears him and his companion talking that they want to kill the widow Douglas. Afterwards, he goes to the Welshman who helps to chase the criminals away. In the meantime, Tom sees a person in the cave and first thinks of help, but it turns out that it is Injun Joe. He does not tell Becky about that and after a long time Tom finds a small hole where they can escape. After some days, Tom wants to visit Becky and her father tells him that the hole has been closed. The boy tells the Judge that he saw Injun Joe inside the cave. So the townspeople go to the cave where they find the dead body of Injun Joe. Tom shows Huck the hole where he got out of the cave and both search and finally really find the treasure inside. In the end, the Widow Douglas adopts Huck Finn. First Huck does not like it but Tom tells him that he can just join his robber band if he stays. Finally, Huck agrees. 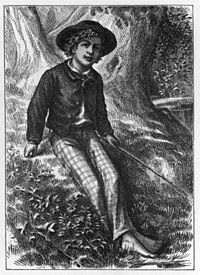 Wikimedia Commons has media related to The Adventures of Tom Sawyer. This page was last changed on 11 April 2019, at 01:00.